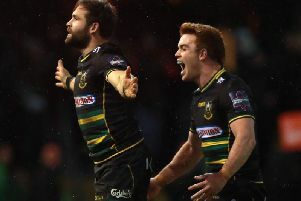 Lee Dickson says Saints are doing things ‘out of the ordinary’ in the bid to retain their Aviva Premiership crown. The scrum-half believes preventing predictability proved key in the 25-20 victory against Saracens last Saturday. And Saints will now look to continue keeping teams on their toes as they seek a second successive title. Jim Mallinder’s men face two more regular season games, knowing a big win against London Welsh on May 9 will secure their top-two spot. That would set up a home play-off semi-final on May 23, seven days before the league showpiece at Twickenham. And after overcoming big defeats at Clermont and Exeter to see off Saracens, England scrum-half Dickson is confident Saints are on the right track. He said: “We started the season well and I hope we have had our hiccup and can look forward to the big games ahead. Play-off games are won on small margins, a few points here and there are big. “There will be a time in the season when you do not click, but in the last couple of years we have done so at the right time. “We went back to basics after losing to Clermont and Exeter: sometimes we can be predictable and teams work us out, so we were looking to do something out of the ordinary. “We put a lot of kicking on (Stephen) Myler against Saracens and it was well executed, with the chase good. “We played a lot of rugby as well, as we did in last year’s final (win against Sarries).